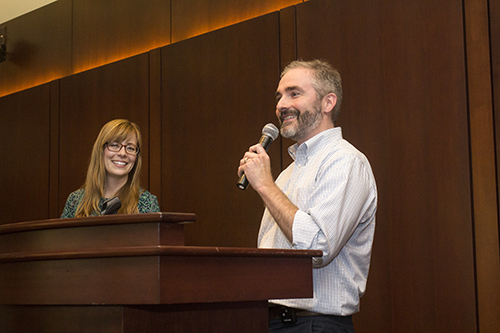 The Dauch Alumni Center provided the setting for the 2017 Recognition Ceremony hosted by the Department of Veterinary Clinical Sciences (VCS) and the Veterinary Teaching Hospital (VTH) in honor of outgoing residents, interns and a graduate student. 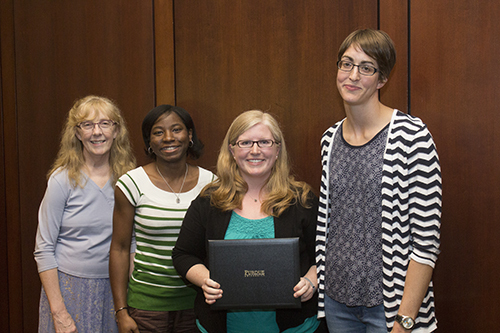 The event on June 22 attracted a crowd of faculty, colleagues and friends and family. 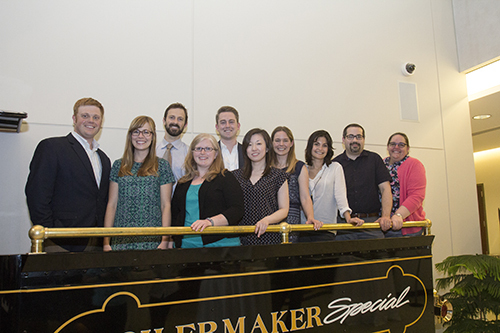 Outgoing VCS residents (left-right) Dr. Alec Davern, Dr. Lisbeth Ambrosius, Dr. Kyle Vititoe, Dr. Amy Yanke, Dr. Benjamin Bergstrom, Dr. Keiko Murakami, Dr. Carrie Fulkerson, Dr. Marine Traverson, Dr. Ewan Wolff and Dr. Kristen Marshall. 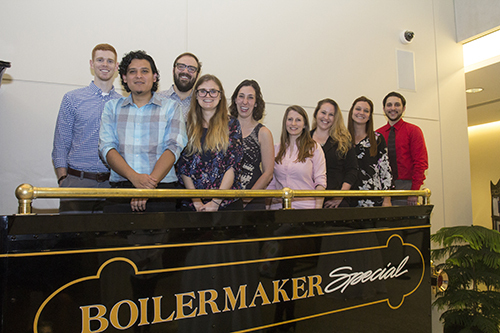 Outgoing VTH interns and veterinary pharmacy resident (left-right): Dr. Steven McIntyre, Dr. Rothman Reyes, Dr. Mark Byrum, Dr. Laura Rayhel, Dr. Katheryn Cooley, Dr. Alexandra LaPorte, Dr. Kira Tyson, veterinary pharmacy resident Shannon Grady, and Dr. Christopher Olmo. Dr. Johnson then introduced each of the outgoing interns and talked briefly about them and their plans before presenting them with their certificate. Dr. Rothman Reyes, who is going to an oncology specialty internship at Georgia Veterinary Specialists in Atlanta. Dr. Kira Tyson, who is going to begin a residency in large animal internal medicine at Washington State University. Also recognized during the program was the outgoing veterinary pharmacy resident, Shannon Grady, and a graduate student, Dr. Nurul Sulimai, who is from Malaysia and earned her veterinary degree at Putra University. She will graduate in August with plans to return to Malaysia and work in the anesthesia group at Putra University’s teaching hospital. Associate Professor of Comparative Oncology Michael Childress congratulations Dr. Lisbeth Ambrosius on completing her oncology residency. 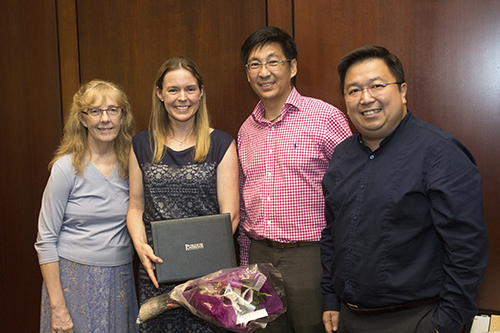 Dr. Carrie Fulkerson, diagnostic imaging resident, with (left - right) Dr. Jean Stiles, chair of the residency training committee; Dr. Hock Gan Heng, clinical associate professor of diagnostic imaging; and Dr. Chee Kin Lim, clinical assistant professor of diagnostic imaging. Dr. Fulkerson will be joining the VCS faculty. Neurology resident Amy Yanke with (left-right) Dr. Jean Stiles and neurology clinicians, Dr. Talisha Moore and Dr. Stephanie Thomovsky. 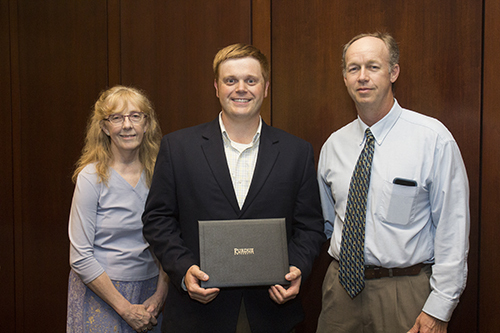 Dr. Alec Davern, large animal surgery resident, with Dr. Jean Stiles and Dr. Jan Hawkins, professor of large animal surgery. Dr. Davern will be joining the Centaur Equine Specialty Hospital team. 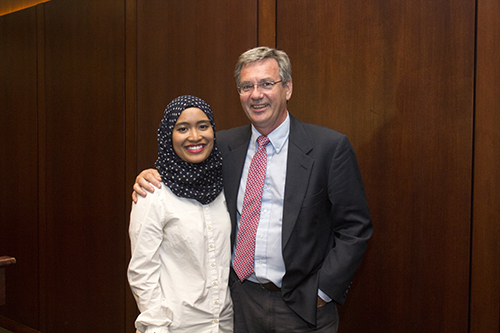 Dr. Gert Breur, professor of small animal surgery, congratulates VCS graduate student Nurul Sulimai, who will graduate in August.